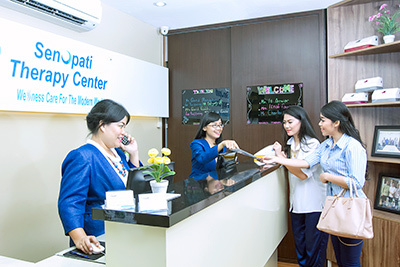 We welcome you to Senopati Therapy Center, a wellness care practice with modern healthcare facilities utilising the latest technology. Your needs will be fully assessed by our professional team. Then, we will create a plan to help you regain and maintain a higher level of health. Your first appointment starts with filling out some forms so that we can understand your medical history and how best to help you. Then, we will perform a thorough examination using advanced equipment. A scan will show us any imbalances that exist on each side of your body, analysing your entire spine from neck to low back. Next, a foot scan will be taken to determine whether your feet are in the proper position to support your body. We usually will give you a chiropractic adjustment on your first visit. If more testing needs to be ordered, such as an MRI, we may wait and adjust you on your second visit. At the end of your new patient appointment, we will schedule you for follow-up visits. Our chiropractor may recommend we see you at a regular frequency for a period of weeks, but these recommendations depend on your condition and how you progress with each visit. Stop by our walk-in clinic for an appointment. Free parking is available, and insurance is accepted.